From the earliest days following the arrival of the first Jewish settlers in Milwaukee, the synagogue has been a high priority. Gathering first in homes for Shabbat worship, the community grew to include three tiny congregations until 1856 when they joined together to form B’ne Jeshurun. A year later they moved into the first synagogue building on Fourth Street between State and Prairie (now Highland Avenue). 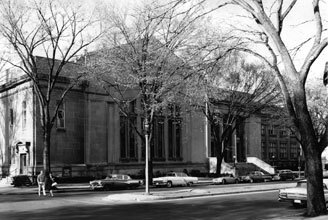 Thirteen years later, 35 families left the congregation to establish a new Congregation Emanu-El, and B’ne Jeshurun remained at its building on 10th and Cedar Street (now Kilbourn Avenue), the site currently occupied by the Milwaukee County Courthouse. Both groups flourished separately for fifty eight years until Emanu-El, in need of larger facilities, broke ground in 1922 for a new build at 2419 East Kenwood Boulevard. When plans for the new courthouse called for the demolition of B’ne Jeshurun’s synagogue, the wheels were set in motion for the 1927 merger of Milwaukee’s two Reform congregations. Today a bronze plaque on the south face of the courthouse commemorates the former B’ne Jeshurun building. Since 1927 the combined congregations have existed as Congregation Emanu-El B’ne Jeshurun. In October 1997 Congregation Emanu-El B’ne Jeshurun dedicated its new building at 2020 W. Brown Deer Road in River Hills on the Joseph & Vera Zilber Campus. It became our permanent home in 2000. In June 2008 we broke ground for a renovation and expansion of our present building. The renovation was completed in September 2009. Congregation Emanu-El B’ne Jeshurun has undergone a profound transformation from its beginnings in 1856. It has become a more diversified religious institution than the founders of the 19th century congregations had ever envisioned. Today Rabbi Marc E. Berkson leads our congregation as we continue to speak to our traditions and ever-changing needs.